The best recipes are ones that are simple, delicious, and make you look like a pro. My coworker planted the seed in my head to try out panna cotta because she loves the stuff and swore to me it’s the easiest dessert to make. Things have been stressful lately and I don’t make the best decisions when I’m hungry. The other night I came home exhausted and starving, so of course instead of making real food I thought to myself “Hey, maybe I’ll try making panna cotta.” That was not the smartest decision. I ended up microwaving a Hot Pocket for dinner. 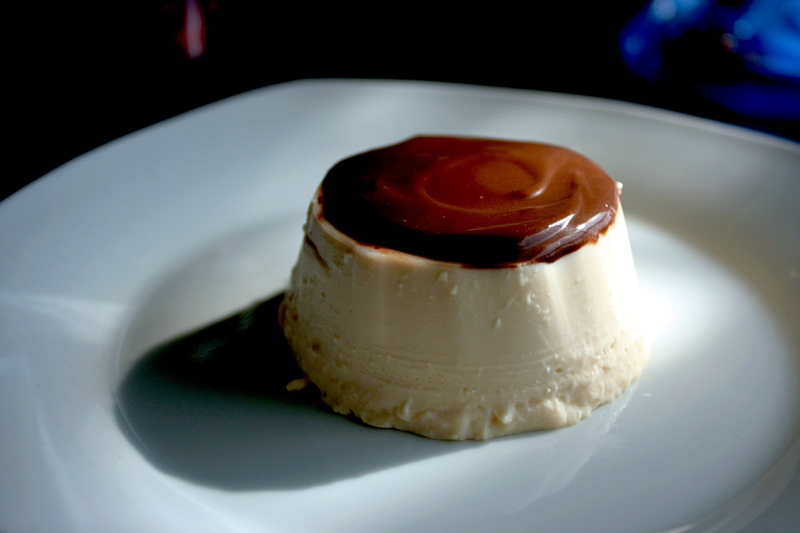 I have to admit though, making the panna cotta was pretty simple and it’s definitely one of those underrated desserts most people don’t order. 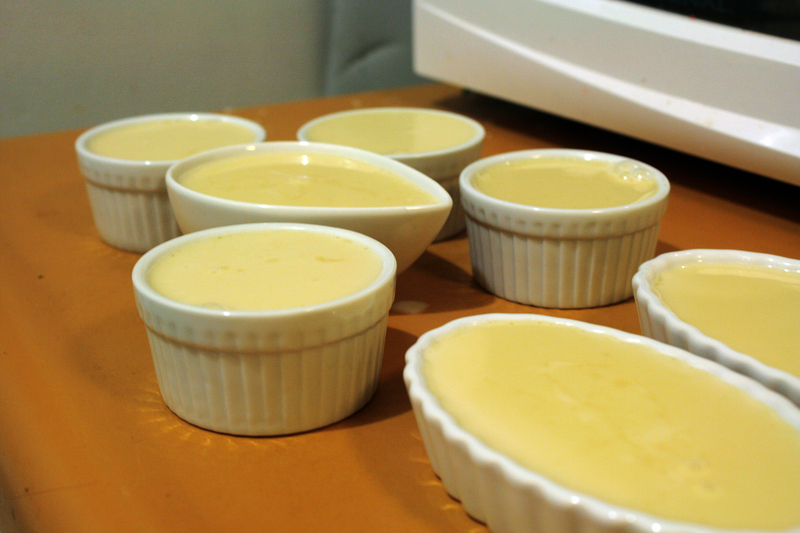 The hardest part was waiting for the cream to set, and that’s only because I’m impatient when it comes to food. 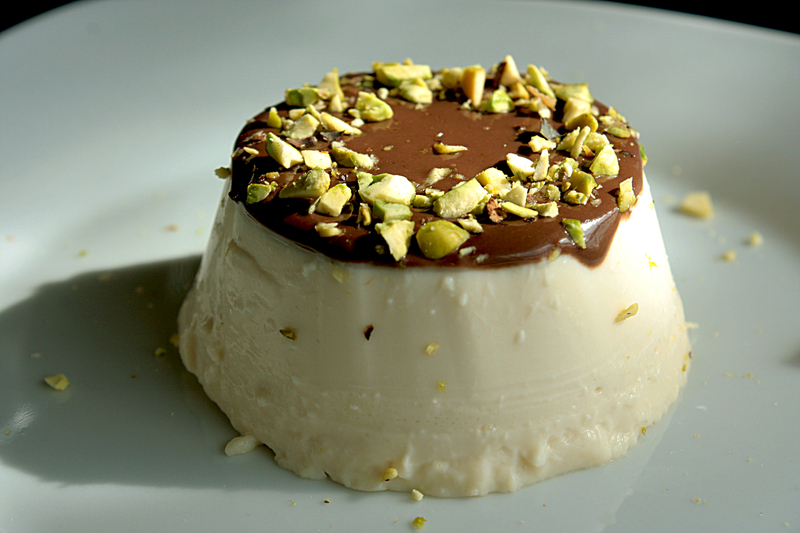 So if you want to impress someone by making something that looks rather difficult but really isn’t, panna cotta is a great option! 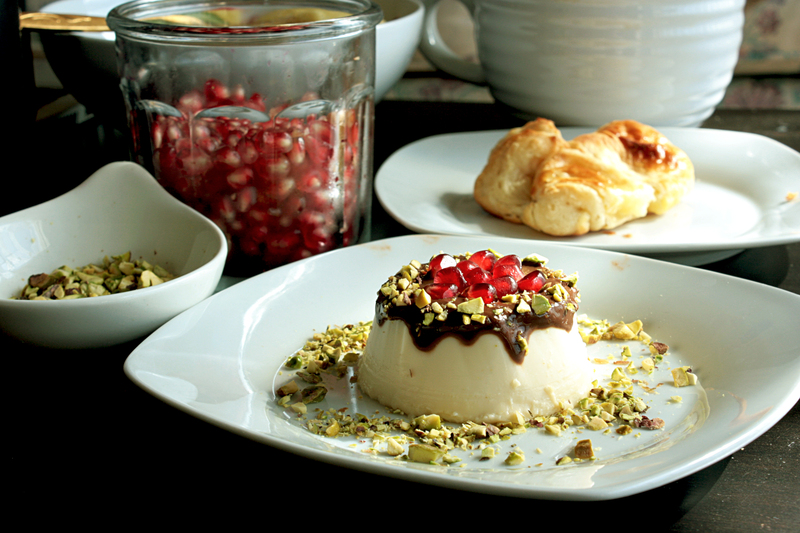 I’ve seen a lot of panna cotta recipes with fruit toppings, but that didn’t really appeal to me. The texture of panna cotta is somewhere in between pudding and jello, so I wanted to offset the creaminess with some crunch. 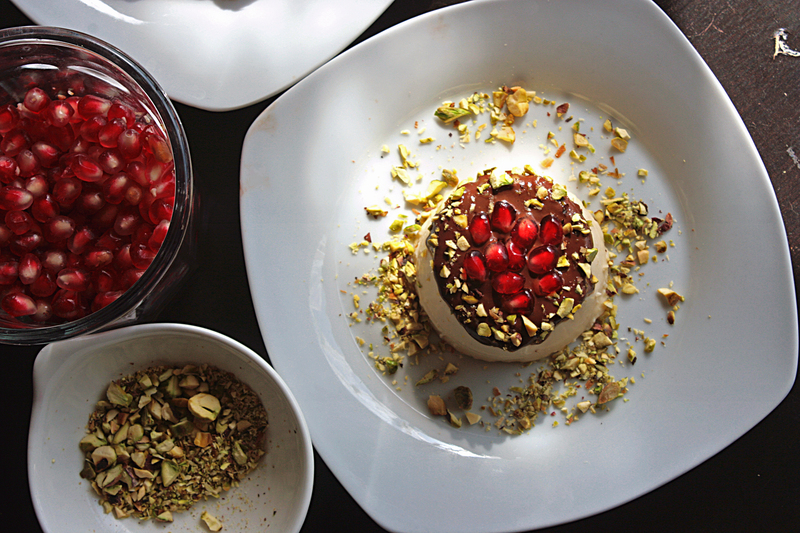 I topped mine with a little bit of thick chocolate sauce (super easy to make too), chopped pistachios, and pomegranate seeds for texture and a little bit of tartness. This makes enough custard for about 6 small ramekins. Keep in mind, it takes about 4 hours to set in the fridge. Mix the gelatin powder into the milk. It will be lumpy and strange looking at first, but let it sit for about 10 minutes and… it will still look strange. Less lumpy, but kind of like creamy cottage cheese, but don’t worry, you’re doing it right. 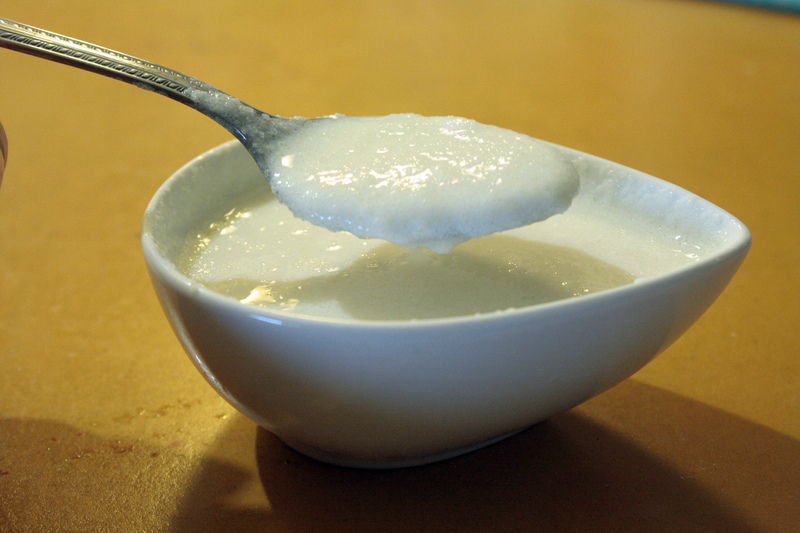 Heat the heavy cream, sugar, and vanilla extract in a saucepan over low heat. When it starts to boil, add your gelatin mixture. I didn’t get a photo of this because it boils over pretty quickly, so be careful! Remove from heat immediately, and keep stirring until the gelatin mix looks fully incorporated. 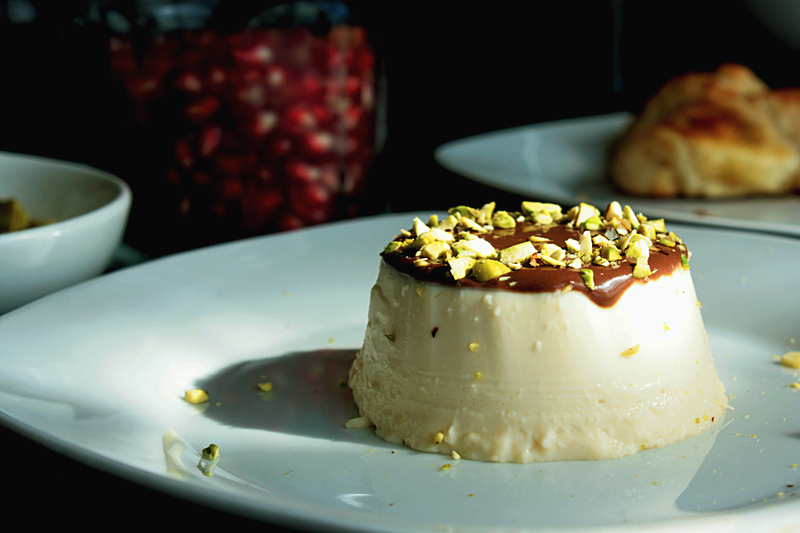 If you want to serve your panna cotta on a plate, prep your ramekins- I coated the insides with a thin layer of butter, which worked just fine. Pour the mixture into the ramekins and refrigerate for at least 4 hours. 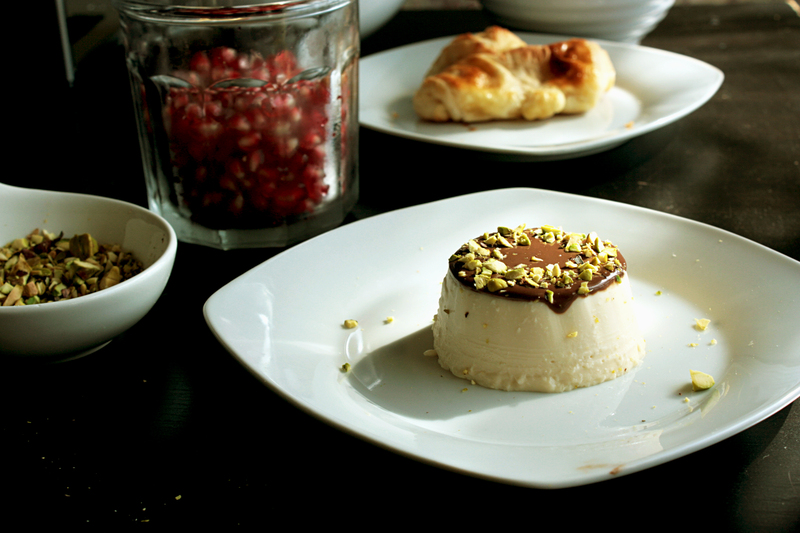 This makes a lot more chocolate than you’ll need for the panna cotta, so either plan on using the extra for another dessert or reduce amounts to one fourth. 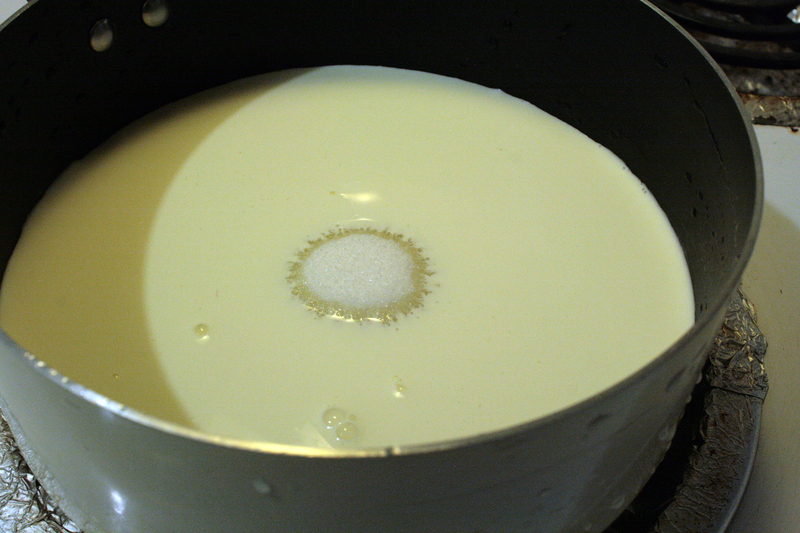 Place evaporated milk in a saucepan over low heat. 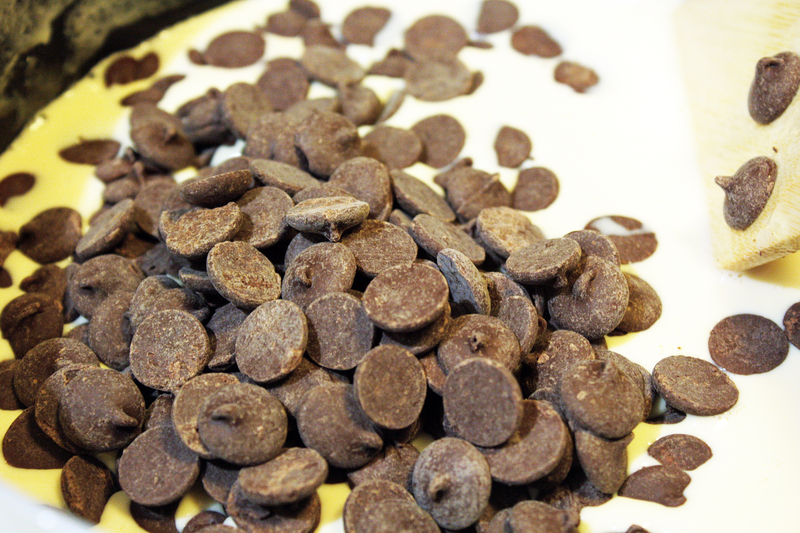 Once warm, add the chocolate chips. 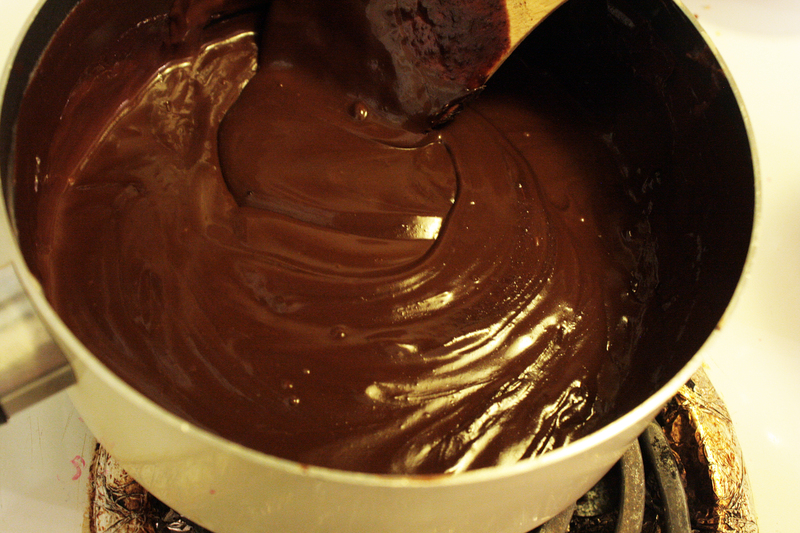 Stir constantly until chocolate is fully melted and looks like the mixture below. I like to keep the burner on low, and if it starts to bubble remove from heat, because I’ve had bad experiences with burnt chocolate before. It’s a sad sad thing. 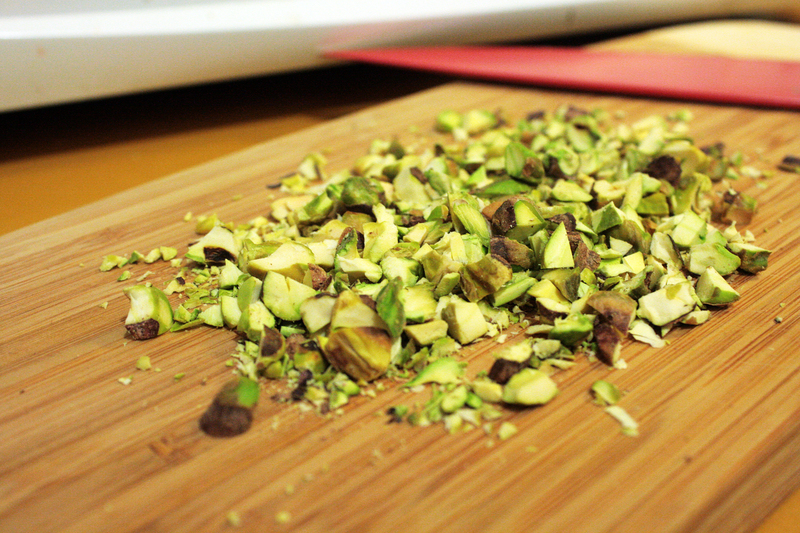 For the other toppings- coarsely chop pistachios. I used less than a quarter cup. Proceed to struggle with extracting your pomegranate seeds from the rind while trying not to stain all your fingers and clothing in the process. Really, though, is there an easier way to do this? 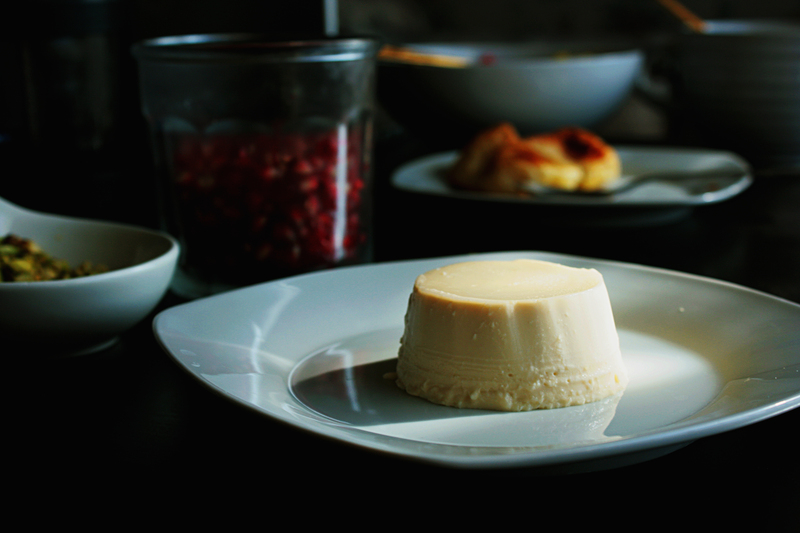 Getting the panna cotta out of the ramekins was a little tricky because I didn’t wait the full 4 hours to let it set. I found that running a citrus knife along the edges was the easiest way to get them out intact, but with more decorative molds, I’m not sure if that would work. You could try warming the mold by running warm water on the outside. 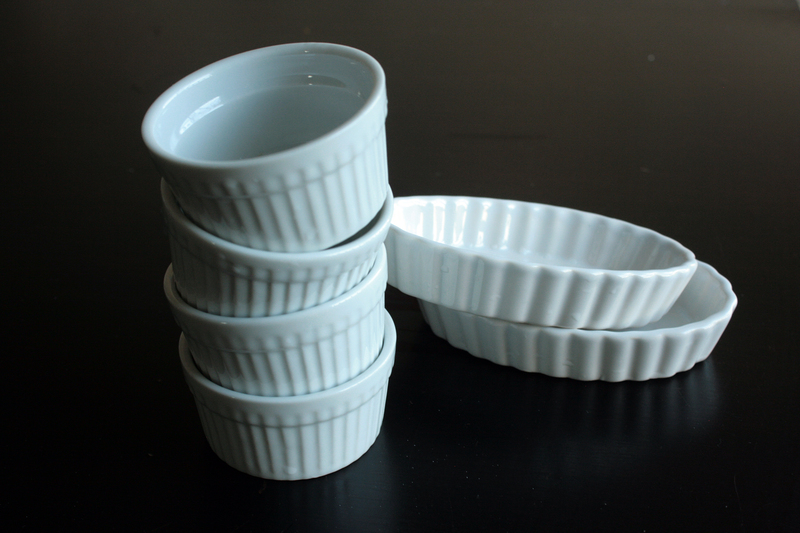 You could also just eat them out of ramekins to avoid all the fuss. 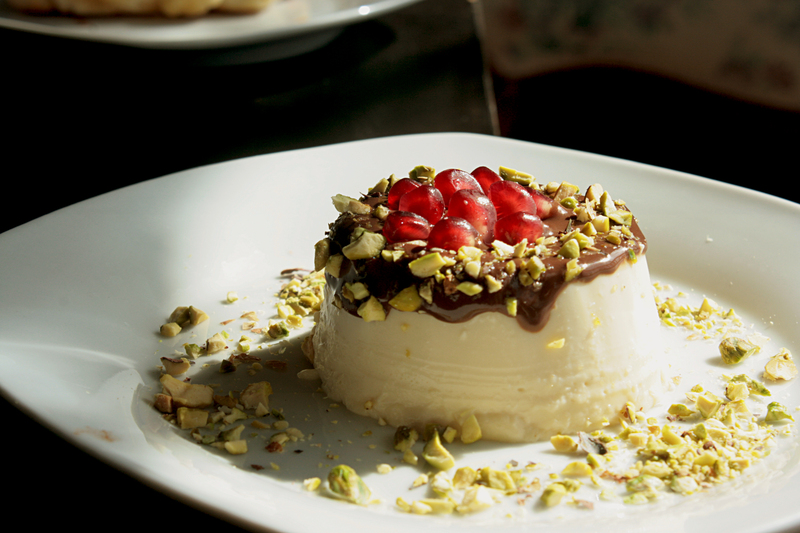 Carefully place your panna cotta on a plate, and evenly spread the chocolate sauce on top. 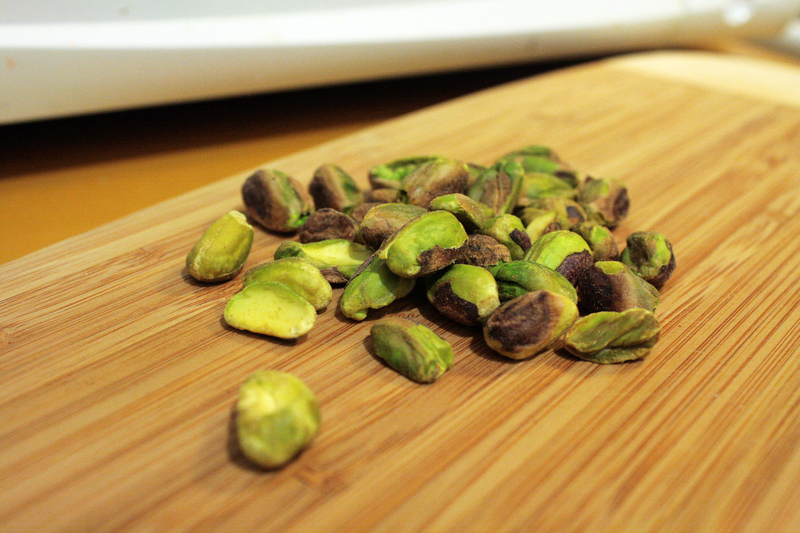 I sprinkled the chopped pistachio in a ring. I could probably eat it just like this too! Last one for this step, I promise- it was too pretty not to take another photo. 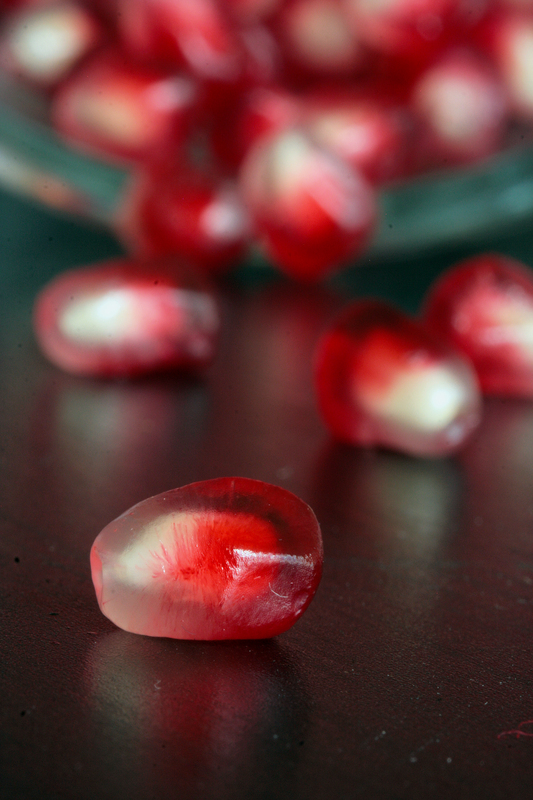 Carefully place pomegranate seeds in the center with the whites of the seeds facing downwards. Tada! It’s super easy and tastes delicious. It also looks pretty fancy; like you spent hours making it, when you really just threw it into the fridge. What’s not to love? I love what you did with this!! I always wondered what panna cotta was. I guess the gelatin substitutes for the egg that you put in a custard. Sounds like a cool and creamy dessert that I will have to try. Thanks. This looks wonderful, even a mom with a toddler can be inspired to make it!